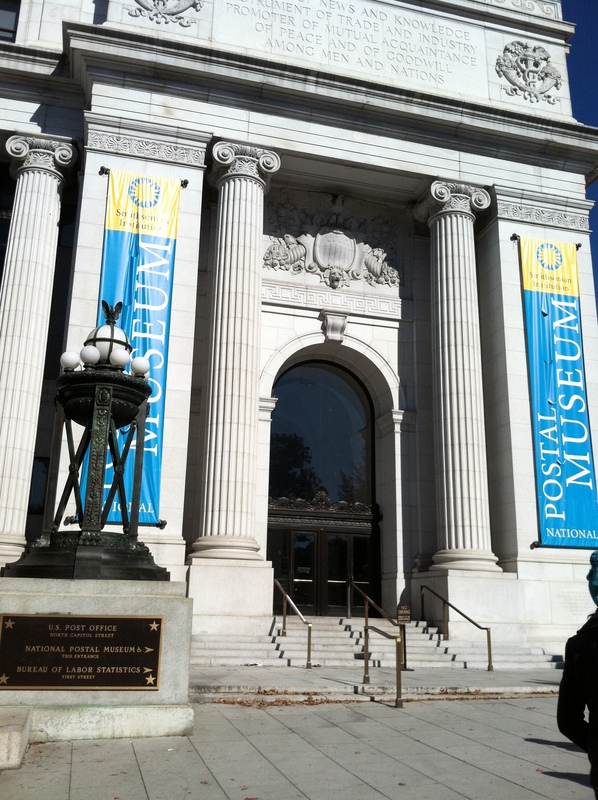 The Smithsonian’s National Postal Museum is one of the most interesting and unique museums in our city. On the surface it houses a history of the postal service throughout the centuries, but more deeply it is an American history museum, telling the story of our country by way of its letters, mail, and press. Your journey through the museum begins along the path of the first mail route in the nation—the undeveloped road between New York and Boston that was used for mail service starting in 1673. Mail carriers along the route would make notches in trees to mark the path through the woods and wilderness of the northeastern U.S. As the mail system developed over the colonial years, it became intricately linked with the politics and feelings behind the revolutionary war. 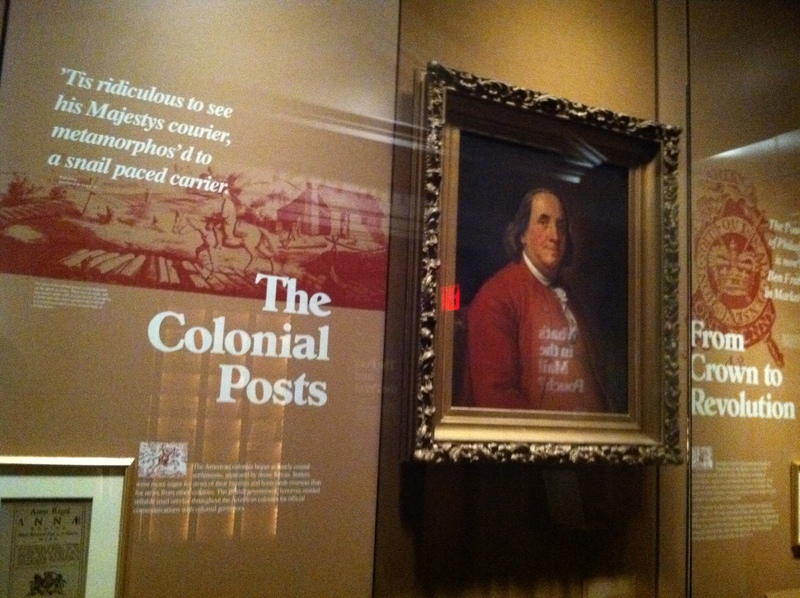 Control of the mail system by the British was one of the first obstacles for colonial resistance to overcome, as only Loyalist postmasters who read all correspondence were employed, and many postmasters would not deliver revolutionary newspapers. Eventually an independent post was developed, becoming another sore spot between the British and rising resistance. These facts are only the very beginning of the relationship between the mail and U.S. history. 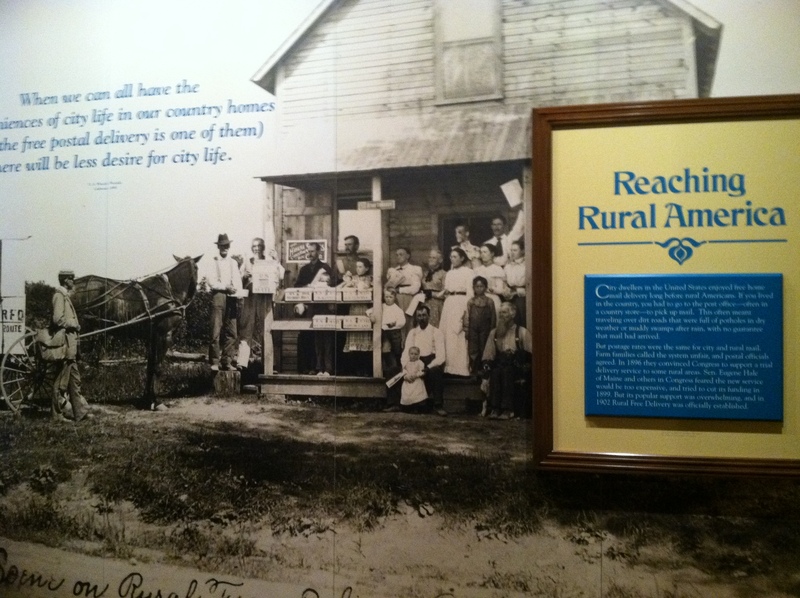 Other portions of the initial historical exhibit are dedicated to war time mail and the changing postal service as the nation expanded west, and the importance of railroads and other forms of transportation not only to keeping settlers informed but providing incentives for them to stake claims in the territories. Interestingly, I learned that the Pony Express was actually only in service for less than two years, despite its romantic portrayals in westerns. Mail has been transported in many ways throughout history—horse, stagecoach, riverboat, dogsled, skis, trucks, airplanes, and others. 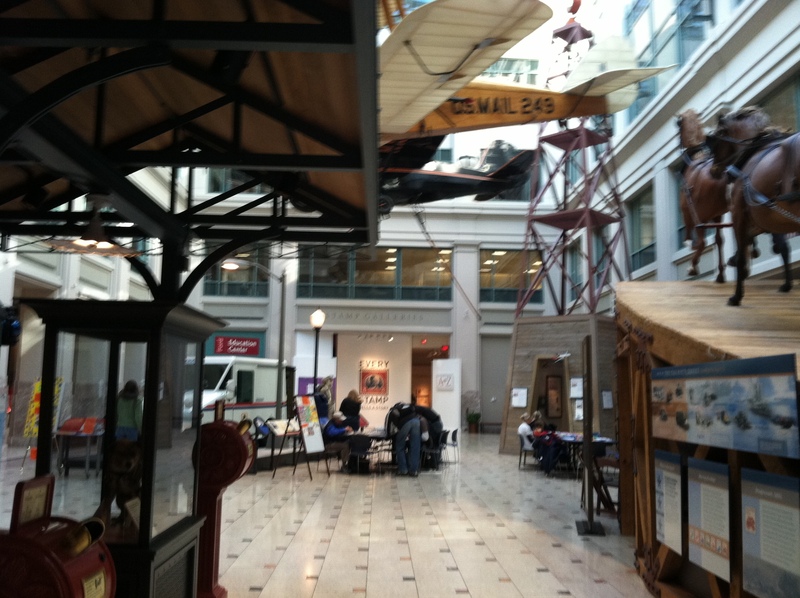 Changing transportation methods of course revamped the face of the mail, and the museum has many life-sized methods of transportation (like mail truck and planes suspended from the ceiling) that serve as a jumping off point for this subject. 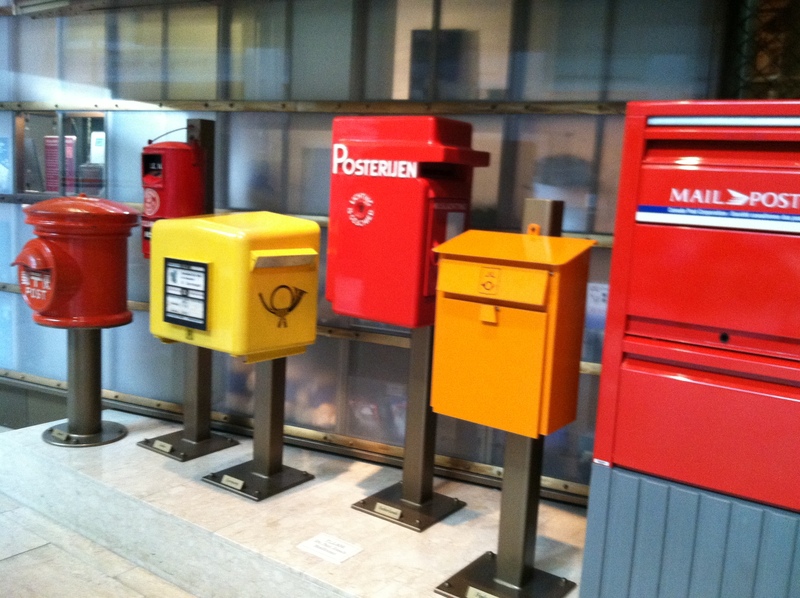 In addition to the exhibits featuring U.S. history, the Postal Museum has a very large collection of stamps and displays about stamp collecting (or philately, for those not in the know). I had no idea there was so much to stamp collecting—it’s not just about the stamps themselves, but their irregularities, first editions, and special issues. This is particularly interesting given the fact that stamps have only been around in the United States since 1847, and since 1840 in England. 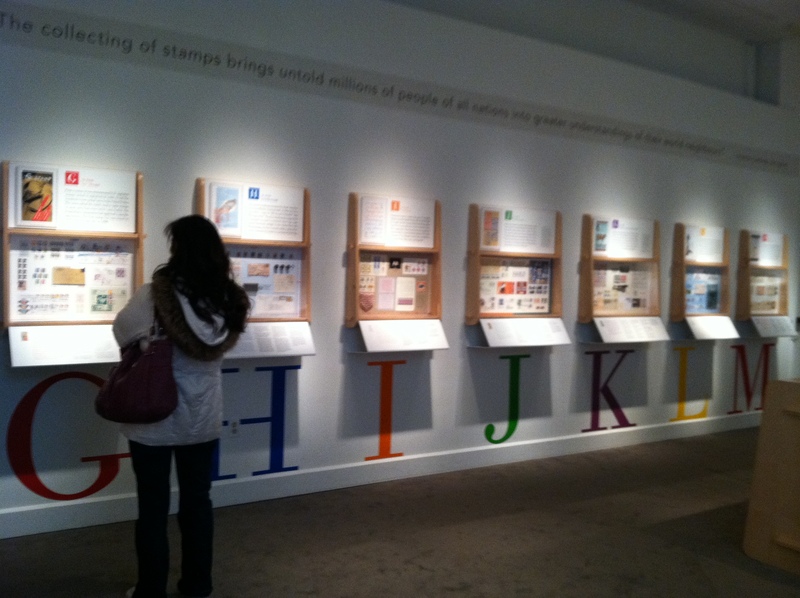 Currently there is a wonderful exhibit celebrating 15 years of the National Postal Museum called “Alphabetilately” that describes in great detail the art of stamp collecting. Today, the U.S. Postal Service delivers 200 billion pieces of mail every year, and 40% of the world’s mail passes through the U.S. postal system. While the National Postal Museum looks at the history of our mail service, it is humbling to realize that we are still a part of our country’s history being made. It is a very fine museum and well worth the visit. To visit: 2 Massachusetts Avenue NW, (202) 633-5555. Open everyday 10am-5:30pm except Christmas Day. Located just steps from the Union Station Metro. Great post, thanks for inspiring another visit to the museum. Hi Erin– I visited on a celebration of Native American history month. I thought the activities were all great, especially making a collage with the stamps provided. A great way to get potential stamp enthusiasts hitting the ground running!